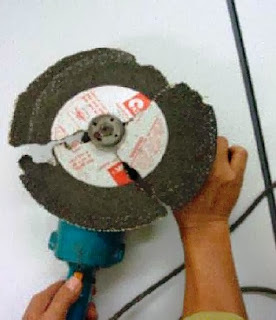 A worker was cutting an aluminum roof using an angle granite grinder. 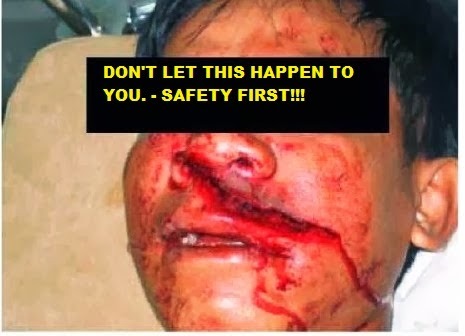 Unexpectedly, the grinder's wheel broke into pieces and hit his face causing serious injury between somewhere his upper lips and nose (See photo below). The injured person has given a first aid at site and then was sent to hospital for further treatment. The doctor at the hospital recommended that the injured person will be hospitalized for about two weeks. 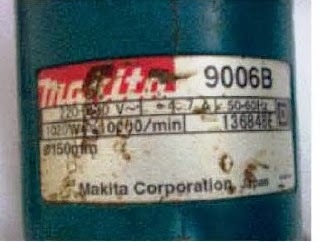 Based on manufacturer specification, Makita grinder model 9006B recommended use, a 6" abrasive cutting wheel with a speed load of 10,000 rpm. But, the worker used a 9.5" abrasive cutting wheel, which was apparently over sized and allowed only to run at a speed of 3400 rpm. The 9.5" abrasive cutting wheel was running at 10,000 rpm which was already over rated speed, causing the wheel broke apart and hit the worker's face. The worker has been warned but ignored the advise or instruction. Not using the required PPE -Face Shield or Face protection. No safety guard was fitted on the grinding tool. Improper use of the grinding machine. (Not following the Manufacturer's Recommendation). Why do we always blame the worker who is already a victim? The real culprits are the management for not replenishing tools required for the job and the supervisor who did not check the worker, tools and ppe before allowing the job to be done.